The patented Sleeve-It System is a code compliant, fence-post anchoring system that integrates stable fence footings into the support structure of retaining walls, while the retaining wall is being constructed. 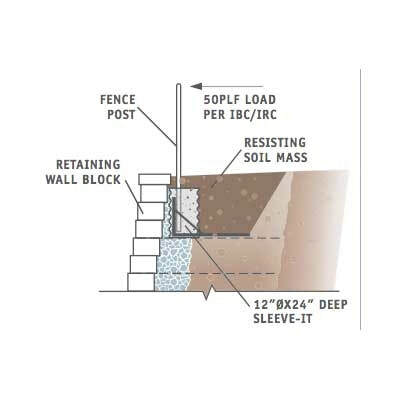 Using the system as part of the Segmental Retaining Wall (SRW) eliminates a 3 foot offset requirement for rails and fences that are added after wall construction, reducing specifier liability and associated costs with building-code compliance. ​Sleeve-It also offers a below grade engineered design that provides superior safety in a cost effective solution.